Digital Leadership Daily. 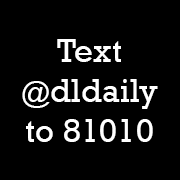 One digital school leadership reading or resource per day, tweeted, texted to your phone, and posted to Facebook. Since it’s just one thing per day, hopefully this will be a low-pain entry point for school leaders who want to learn and grow in this area. Thanks to Eric Sheninger for allowing me to riff off the title of his excellent book, Digital Leadership. Please share with the school leaders in your area. I don’t think it can get any easier to learn than this… Thanks! Thanks for creating this! Just signed up. Looking forward to seeing the resources that you are sharing, that’s for sure. Also looking forward to seeing Remind used in this way. Planning on trying a similar idea with the parents and students on my team.